The young dolphin Morning Star, who feels different and estranged from her family pod becomes captured and taken to a petting zoo aquarium. During her captivity, she helps to discover a method of inter-species communication. Star also realizes that humans are causing the many ecological problems in the sea. 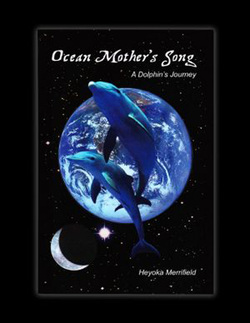 Determined to restore balance, she escapes and goes on a quest to help find a way to heal her Mother Ocean. Heyoka spends much of his life in nature and with a close relationship with the animal powers. He was inspired to write this story after swimming with both dolphins and whales feeling a mutual delight and communion in their contact. 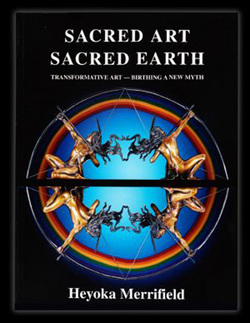 "The Path of Sacred Art" is Heyoka Merrifield's most recent book, a new and completely enhanced version of his "Book of Shrines". He uses prose, poetry and photographs to tell how his love of nature and the world's spiritual traditions awakened his artistic vision. 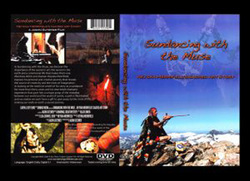 He describes how he has been inspired to create shrines, in the tradition of our ancestors, to express the aspects of humanity's mythologies that we now require to restore harmony with Mother Earth and all our relations - for the next seven generations.